Want to improve your writing? This guide offers 31 clever tricks based on research in psychology. Which words should you use? How should you frame the offer? How do you sell without appearing sleazy? Luckily, copywriting is an art AND science. In this article, you’ll learn 31 copywriting tips — based on academic research — that will maximize the persuasiveness of any message. PDF Bonus: This article is 5,648 words. Click to download the full PDF and checklist, so that you can easily reference it. Persuasion isn’t the only goal of copywriting. In this part, you’ll learn how to convey your message in the clearest, most effective way possible. Side note: all of the illustrations in this article will reference a hypothetical productivity app that you created. Hopefully the consistent example will help you apply the tactics to your own projects. When your writing is unnecessarily complex, readers perceive you to be less intelligent (Oppenheimer, 2006). You can thank processing fluency. If you have trouble processing written content, your brain experiences a negative emotion. It then misattributes that negative emotion to the content that you’re reading. To increase the fluency of your copy — and to prevent those harmful evaluations — you need to simplify your message. In this section, you’ll learn a few research-backed techniques to boost the clarity (and persuasiveness) of your writing. In passive sentences, the subject is the recipient of the action. In active sentences, the subject performs the action. PASSIVE: Some interesting tactics are explained in this article. ACTIVE: This article explains some interesting tactics. Active sentences increase processing fluency. Because readers can digest your message more easily, they experience a positive emotion (which they misattribute to your copy). Your skin’s natural oils keep it silky and supple. As you age, it becomes less elastic and the production of oil slows down. Aging can cause dull, dehydrated skin. Your skin’s natural oils keep it silky and supple. But as you age, your skin becomes less elastic and the production of oil slows down. That is why aging can cause dull, dehydrated skin. Those passages illustrate coherence markers. Most advertisers remove coherence markers because they don’t add semantic meaning. However, research shows that coherence markers boost clarity and persuasion (Kamalski, 2007). So keep those subtle words and phrases throughout your copy (like the “so” at the beginning of this sentence). Hosman (2002) explains the connection between persuasion and lexical diversity. Readers prefer messages that contain a variety of different words. Readers perceive messages with a high TTR to be more interesting. And they evaluate communicators more favorably. You should still avoid complex language. Just incorporate simple — yet varied — word choices. “…life insurance companies use ideas associated with various symbols such as umbrellas (Travelers), rocks (Prudential Insurance Company), and hands (Allstate) to convey qualities of protection, sturdiness, and support” (Zaltman, 2008, p. 35). Generic claims are the plague. They’re everywhere. Don’t get me wrong — the underlying messages are great. But it sounds like you’re selling, rather than telling. You’ll have 100 percent uptime…guaranteed. Suddenly your message becomes more believable and persuasive. In this case, you’re telling, rather than selling. When possible, you should also incorporate large numbers. According to a study by Startup Moon, headlines with large numbers are more likely to go viral. 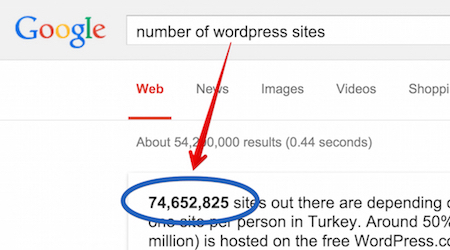 Now you have a better headline: 75 Million Websites Are Vulnerable to a Security Flaw in WordPress. When we provide statistics, we’re usually trying to emphasize the importance of an issue. FRAME 1: Patients similar to Mr. Jones are estimated to have a 20% chance of committing an act of violence. FRAME 2: 20 out of 100 patients similar to Mr. Jones are estimated to commit an act of violence. Both messages are essentially the same. However, twice as many clinicians refused to discharge the patient in FRAME 2. You need to consider two factors: familiarity and emotion. If your main goal is comprehension, then choose the perspective that generates the most familiarity with readers. If you’ve never been to prison, then SENTENCE 1 — the outside perspective — will be more effective (Jiang & Wyer, 2009). Since that framing is congruent with your experience, it increases processing fluency. But what if you’re trying to generate an impact on readers? In that case, choose the perspective aligned with the most emotion. In SENTENCE 2, readers construct the mental image based on the perspective of bank customers — the emotional perspective. So that sentence generates a stronger impact (Jiang & Wyer, 2009). And those are good…but they’re intangible. So they could be better. In turn, the savings become tangible. Customers can visualize the benefits. So they’re more likely to appreciate the value of your offering. You could also emphasize a hedonic alternative (e.g., vacation). Those alternatives will be more persuasive (see my article on choice psychology). When possible, transform numerical attributes into a semantic visual. For example, Peters et al., (2009) found that people could evaluate a hospital’s quality more effectively when numerical attributes were presented in a good/bad scale. Conveying your message is important. No doubt. However, your copy will usually have an underlying goal. Oftentimes, you’ll want readers to complete an action — whether it’s buying your product, donating money, or caring about your cause. This section can help. You’ll learn a few copywriting tips that can influence readers to complete your call-to-action. You just learned some techniques to boost the clarity of your writing. With a greater ease of processing, your readers indirectly experience a positive emotion (that will be misattributed to you and your content). In this section, you’ll learn a few copywriting tips to directly trigger a positive emotion in your reader. As humans, we experience implicit egotism, a natural tendency to be self-centered. We nonconsciously gravitate toward stimuli that resemble ourselves. Upon hearing your own name, certain brain regions become activated — including the middle frontal cortex, middle and superior temporal cortex, and cuneus (Carmody & Lewis, 2006). Apply that insight to your copy. By incorporating your reader’s name, you’ll trigger a positive emotion, enhancing the perception of your message. If you send email blasts, don’t forget to use the merge field options. Not only should you insert people’s name into the header of the email, but you should also sprinkle their name throughout the body of your email. We’re also influenced by ingroups — people who share a similar social identity (Van Bavel, Packer, & Cunningham, 2008). The researchers paired each nonsense syllable with a pronoun — either an ingroup pronoun (e.g., “us”) or an outgroup pronoun (e.g., “them”). Even though participants couldn’t remember the specific pairings, they developed an unconscious preference for nonsense syllables that were paired with an ingroup pronoun. When you use 1st person plural pronouns (e.g., us, we our), you trigger a subtle — yet positive — emotional response in your readers. Those positive emotions will then become misattributed to your content. Persuasion strategies should always be subtle. If readers feel like you’re trying to persuade them, they develop psychological reactance (Brehm, 1966). Instead of listening to your arguments with an open mind, they resist your persuasion attempt. To prevent that reactance, be stealthy. How? This section will explain a few tactics that will disguise your persuasion attempt — without being manipulative. That framing reduces psychological reactance. With more freedom, your readers will develop a stronger genuine desire to complete your call-to-action. Some copywriters are scared to include drawbacks in their copy. And it makes sense. If you want people to complete your call-to-action, why would you describe negative features? Seems counterproductive. Nevertheless, research shows that two-sided arguments are more persuasive (Rucker, Petty, & Brinol, 2008). When you present both sides of an argument, people perceive you to be more rational. It seems like you chose a side carefully. So readers feel more comfortable joining your side. You’ll also take advantage of the spotlight effect (Heath & Heath, 2013). We tend to focus on information in front of us, while ignoring information offstage. By incorporating some negative information, your readers will assume that those drawbacks are the only drawbacks to your argument. But here’s a caveat. You should give your drawbacks a positive spin. For example, you can use this tactic to reinforce your target market. Explain that your offering doesn’t include a particular feature because you focused more attention in another area — an area that’s more important to your target market. Even if we weren’t experiencing those emotions, the mere behavior triggers those emotions within us (Wilson, 2002). How does that relate to copywriting? If you don’t mention your competition, readers are more likely to search for competing solutions. That’s bad. In the mere act of searching, people are more likely to infer that your solution is less attractive (Ge, Brigden, & Häubl, 2015). However, by mentioning your competition, you prevent that search from happening. Readers feel like they’ve already done their homework, so they’re more likely to stick with your solution. When mentioning the competition, don’t admit defeat. Simply mention the alternatives so that you can explain the difference(s) in your solution. When we write copy, we feel a natural urge to emphasize our solution. And why wouldn’t we? If we want readers to complete our call-to-action, shouldn’t we describe the benefits of it? Absolutely. But…never start your pitch immediately. Always disarm your readers first. 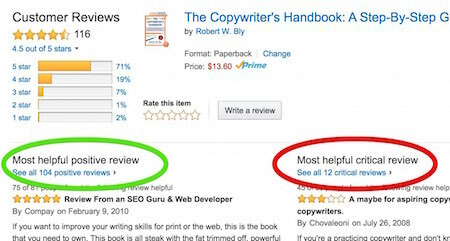 When people start reading your copy, they shouldn’t recognize an underlying motive or call-to-action. If readers sense that you’re trying to persuade them, they’ll be more likely to reject your benefits and arguments (Petty & Cacioppo, 1979). So what do you do? Start by agitating the problem. Explain why the underlying problem is difficult or painful. Once you hook them in, THEN reveal your solution. If you’re a seasoned copywriter, you’ve heard the advice. Write copy that is clear and direct. So then…why do you rarely see direct claims? Sure, you could argue that those words don’t grab attention. And that’s true. But direct claims are also less persuasive. Why? The answer involves self-generated inferences (see McQuarrie & Phillips, 2005). Direct claims are explicit. There’s no other interpretation. Indirect claims — such as metaphors — require interpretation. We infer meaning. And that’s key. By making an inference, WE generate the meaning. INDIRECT: The freshness of the outdoors. Now in liquid form. With the INDIRECT headline, YOU construct the meaning. You might imagine the outdoors, associating a brisk and refreshing emotion with Tide. Regardless of the inference, YOU generate the meaning. YOU become the source. So your brain places more trust in the information. In the first example, I say that my book is jam-packed with actionable content. It’s a direct claim. There’s no missing gap. Your solution should always relieve some type of pain that the reader is experiencing. If you want readers to appreciate your solution, you need to remind them of the pain. How is it negatively affecting readers? We’re biologically structured to avoid pain. So if you can trigger that feeling of pain, your readers will be more likely to pursue your solution. This section will explain a few copywriting tips to agitate the problem. Opposing attitudes can be stronger than supporting attitudes. For example, we show stronger support for political candidates when our attitude is framed as opposing the other candidate, rather than supporting the original candidate (Bizer & Petty, 2005). Instead of convincing readers about the benefits of your solution, emphasize their disdain for the underlying problem. Readers begin empathizing with those descriptions. They imagine themselves experiencing those negative emotions. They become frustrated with those problems. Once they develop that opposition, then present your solution. If your copy starts with your solution, you’ll kill that empathy process. Readers will become closed-minded, resisting any benefits that you offer. So always start by emphasizing your reader’s disdain for the underlying problem. Do you ever use rhetorical questions in your writing — like this one? If not, you should. On the surface, they seem innocent. But don’t be fooled. Rhetorical questions make your arguments more persuasive (Petty, Cacioppo, & Heesacker, 1981). Through their implicit response, readers consider your arguments more carefully. They become engaged. Assuming that your arguments are valid, readers will be more persuaded by them. Earlier, I mentioned the benefits of incorporating your reader’s name into the copy. When you can’t use that technique, you can achieve similar effects by using 2nd person pronouns, such as you and your. The second frame — because it used “self-referencing” language — generated a more favorable evaluation of the calculator. Those 2nd person pronouns enhanced the relevance of the issue, thereby agitating the problem more effectively. Self-referencing language can be very persuasive. However, you can achieve an equally — if not more — powerful effect by demonstrating an impact on other people. Especially when the impact is negative. FRAME 1: Hand hygiene prevents you from catching diseases. FRAME 2: Hand hygiene prevents patients from catching diseases. The second frame influenced more hospital staff to wash their hands (Grant & Hoffman, 2011). When possible, explain how other people will be negatively affected if readers don’t complete your call-to-action. Those statements emphasize verbs. They answer the question: what does Jennifer do? Those statements emphasize nouns. They answer the question: who is Jennifer? Both sets of statements convey the same meaning. However, the second set generated a stronger impact. With nouns, those traits seemed central to Jennifer’s identity. How can you use that tactic? For one, you could label your audience with a funky noun (any Beliebers reading this?). But you don’t need to go that far. Here’s a simpler idea. If you’re a blogger, instead of thanking readers for doing something (e.g., reading your content), thank them for being something (e.g., being a fan of your content). That second frame will generate a stronger impact on their attitude toward your content. IMMEDIATE DECISIONS: People develop a concrete mindset. In turn, they place greater weight on NUMERALS. DISTANT DECISIONS: People develop an abstract mindset. In turn, they place greater weight on UNITS. Consider the shipping time for an online purchase. During the purchase process (i.e., an immediate event), customers will be focused on numerals. So you should minimize those numbers (e.g., 1-3 weeks). Afterward, when customers are waiting for the delivery (i.e., a distant event), they’ll be focused on units. So you should minimize the units (e.g., 7-21 days). Most humans experience a need for closure (Krugalinski & Webster, 1996). When we face ambiguity, we seek comprehension. Here are some examples of different openers. Last year, I suffered a near-fatal heart attack. More on that later. In 2013, I sold all of my possessions. I’ll explain why soon. With a clever technique, I made $53k from affiliate marketing. You’ll see how in a few paragraphs. The first statement will trigger their curiosity for an explanation (you can choose any “shocking” anecdote — as long as you connect it to your offering). The second statement will incentivize readers to stay engaged to resolve that ambiguity. Once you’ve agitated the problem, then — and only then — should you start your pitch. This strategy will teach you the best way to present your offering and persuade readers to complete your call-to-action. Why are people completing your call-to-action? Are they trying to gain something or prevent something? Consider your productivity app. Why is your target market buying it? Your copy should match their mindset. With congruent copy, you increase processing fluency (Lee, Keller, & Sternthal, 2010). People can digest your message more easily, so they experience a stronger reaction to it. You want to deemphasize your persuasion attempt. However, you don’t want to use weak language. If your main goal is conveying information (e.g., through a blog article), you can use those phrases if you want to seem unbiased. However, if your main goal is persuasion, you should avoid those hedges, disclaimers, and tag questions — all of which reduce the persuasiveness of your offer (Blankenship & Holtgraves, 2005). In Thinking Fast and Slow, Kahneman popularized the sheer extent of our irrationality. We believe that our decisions are based on careful reasoning. But that’s not the case. Most of our decisions — even important ones — are quick and mindless. Justification is a great example. When an argument contains any justification, we mindlessly assume that the justification is valid (so we’re more persuaded by it). Even if two arguments contain the same reasoning, merely including the word “because” will make one argument stronger than the other (Langer, Blank & Chanowitz, 1978). Since _______, you should do XYZ. When most readers encounter those signals, they’ll automatically assume that your justification is valid. Don’t overlook the sequencing in your message. Always position strong benefits toward the beginning of your message. You might be familiar with the primacy effect — information has a stronger impact when it’s presented at the beginning of a sequence (Murdock, 1962). When your first benefit is strong, you raise expectations for the remaining information. Those expectations, in turn, generate a more favorable perception. Your initial arguments will also generate a stronger impact on long-term memory. When readers recall the benefits of your solution, they’ll be more likely to remember the initial reasons that you gave. So you want those reasons to be strong. People evaluate information differently — depending on promotion vs. prevention needs. In turn, certain argument styles are more effective. Wan, Hong, and Sternthal (2009) found that simultaneous arguments (e.g., comparison tables) work better for prevention needs. Those side-by-side comparisons reinforce the accuracy of the decision. Conversely, sequential arguments (e.g., lists of benefits) work better for promotion needs. Those consecutive structures mimic the perception of progress. When writing copy, consider the decision timeline. When do readers need to act? That answer should dictate the framing in your copy. Your copy should agitate those pain points. For example, Mogilner, Aaker, & Pennington (2008) tested different ad framing — prevention vs. promotion —for a travel service. PREVENTION ads performed better for IMMEDIATE decisions (i.e., last-minute vacations). This framing agitates the feasibility. PROMOTION ads performed better for DISTANT decisions (i.e., vacations that were months away). This framing agitates the desirability. When the ad copy matched their mindset, people were willing to pay a higher price for the travel service. 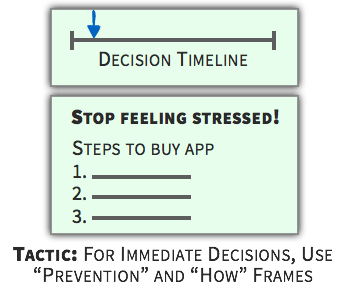 A productivity app would be a simple — usually immediate — purchase decision. Thus, you should emphasize a “prevention” frame to agitate feasibility. You could explain “how” the app increases productivity (i.e., feasibility of benefits). Or you could outline steps on “how” to buy the app (i.e. feasibility of purchase). Rather than spew random information, choose arguments that will generate the strongest impact. So…which arguments should you choose? You’ll want arguments that minimize risk. And every situation has different types of risk. 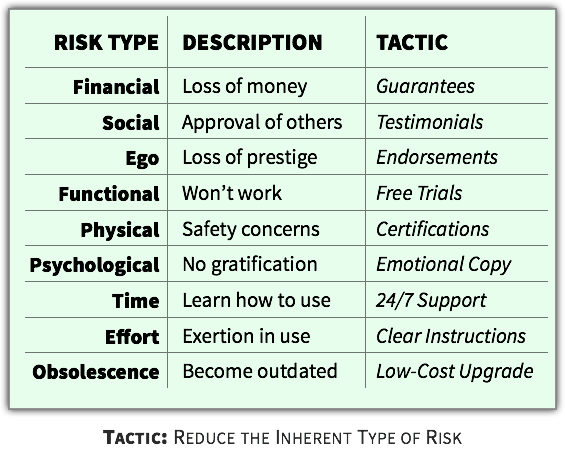 For example, Lantos (2011) describes 9 types of risk. Identify your risk. Then adjust your copy accordingly. Copywriting is a science. With a few small changes, you can make a large impact on the persuasiveness of your message. But you should be realistic. At the end of the day, writing is still an art. You can’t transform a crappy painting into a masterpiece with a few brush strokes. Likewise, you can’t transform crappy copy into a persuasive message with a few minor tweaks. You need good copy at the heart of your message. Once you have those foundational skills, then you can make those extra tweaks to maximize the impact of your message. And if you’re still hungry for more copywriting content, you might enjoy my article on the psychology of stock photos. Unfortunately, I’m at a disadvantage by discussing persuasive writing. If I end with a call-to-action (and use the tactics from this article), then I’ll look sleazy. Whoops. Not very conducive. So I’ll just end with a straightforward call-to-action. If you enjoyed the article, then you’ll enjoy my other content. You can subscribe to my blog by downloading the full PDF + checklist.